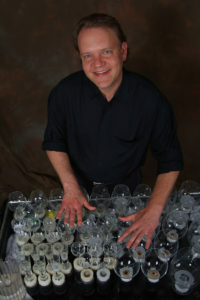 The Glass Harp Music program combines music, scientific demonstration, stories of the origins of glass and water-tuned instruments, audience participation, and a question and answer/musical request segment. While the focus is on glass music, strong emphasis is placed on the inventive process and the experience of building a musical instrument at home from everyday objects. Assemblies last approximately 50 minutes and can be shortened if necessary. School program study guides are sent 3 weeks prior to the visit. * *SCIENCE: The program explores the science of sound and elementary physics related to sound and musical instruments, and various ways sound can be manipulated, especially in the example of water-tuned instruments. * *HISTORY AND CULTURAL STUDIES: Students are exposed to examples of ancient Asian water tuned instruments, and to early water glass instruments played in Europe. A third historical/cultural segment woven in to the program involves specifically Dr. Benjamin Franklin’s invention of the Armonica, an advanced glass instrument for the late 1700’s. * *MUSIC: In exploring the various ways a glass instrument can be assembled, students are exposed to the musical science of intervals and harmony. European classical music is played, as well as pieces composed for the armonica by Mozart and Carl Leopold Rollig. Other selections include Jazz standards, movie themes, Appalachian folk music, Celtic music, and popular songs.